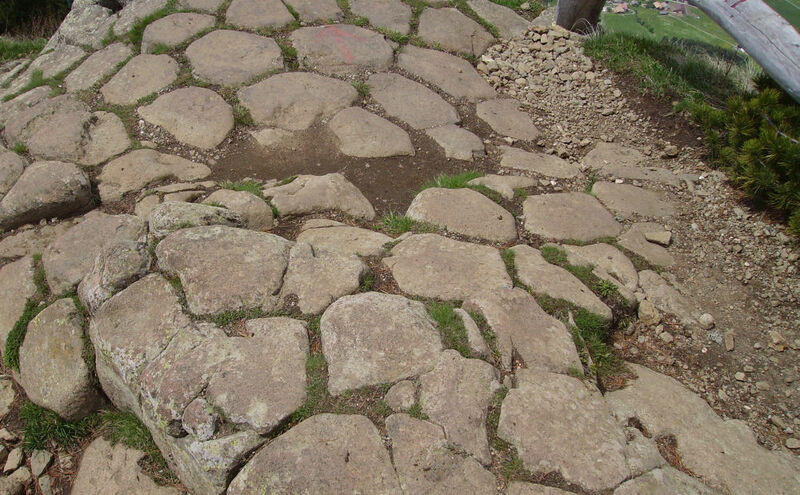 Long before naturalist and the columnists of the geoblogosphere became interested in columnar jointing people tried to find an explanation for these strange outcrops. Fig.2. 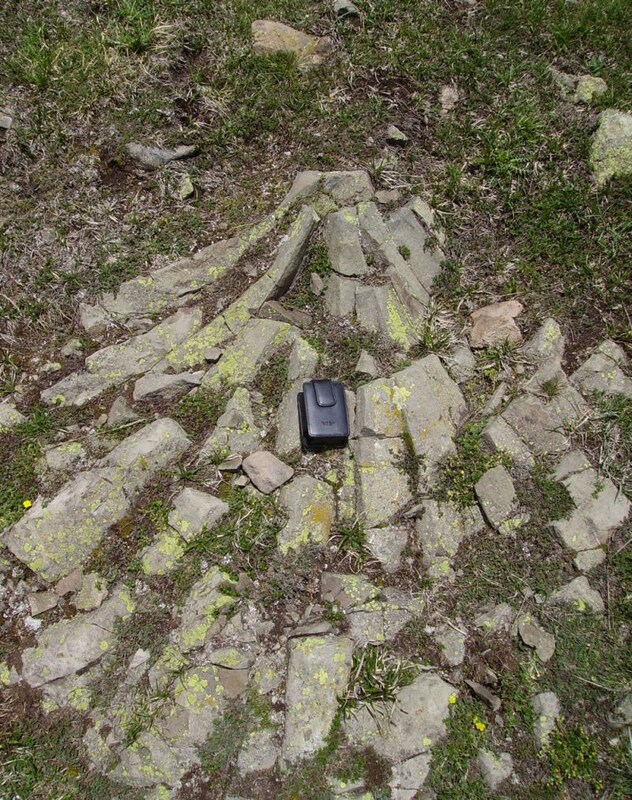 A fan of columns found in Ladinian (228-237Ma) basalts, Seiser Alm, South Tyrol. According to ancient Celtic myth once on the shores of the county of Antrim in Ireland lived a giant named Finn McCool. One day he felt in love with a beautiful giantess living in Scotland. To be with his beloved, he chose to build a bridge, made of basalt columns, so that she could come to him and visit him without getting splashed by the waves of the sea. Fig.3. "Giants Causeway", copper engraving from a French "Encyclopédie", 1768. 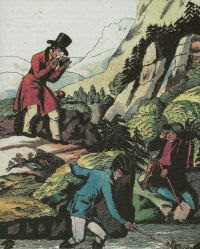 Another version of the myth tells of the ancient rivalry of McCool to another giant living on the other shore of the Irish Sea, the Scottish Benandonner. One day, Benandonner insulted McCool so shamefully, that McCool decided to build a bridge made of basalt columns and invade the reign of his opponent. Soon the bridge was finished, and seeing his furious opponent approaching, Benandonner became afraid of the battle. So he asked advice to his artful wife. She took her husband, dressed him up like a child and hided him in his bed. As McCool entered the castle, he asked who the men was snoring so loud in the bed. The giantess responded: “Oh, it’s only our youngest, my husband will be back soon.“ McCool became properly scared, if this was the child, how big would be the father?! He withdrew, running as fast as he could back to the Irish coast, destroying the bridge of columns behind him – so that’s why we today see ending the bridge in the middle of the sea. 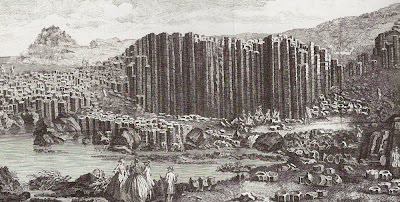 Only in 1693 an expedition of the Philosophical Society of London will confirm the natural origin of the basalt columns at Giants Causeway. The first scientific figure of prismatic basalt columns near the city of Stolpen (Saxony), was drawn by of Johannes Kentmann. 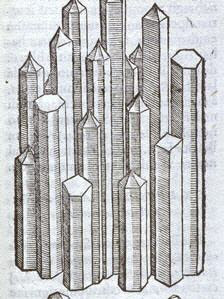 Kentmann named them, after Agricola, "Lapis basalts", and interpreted them as giant crystals, note the - imaginary- pyramids on top of some of the columns to support this interpretation. The idea of rocks formed by crystallisation from aqueous solutions will strongly influence the history of geology. This outcrop was illustrated in Gesner's book "De omni rerum fossilium genere" of 1565, and it is the first printed and widely distributed image of columnar basalt. Fig.4. "Lapis basalts", as seen by Kentmann 1565.